Weight Watchers-You've Come a Long Way, Baby! My sister just called to tell me about an old email she just came across. Then, she deteriorated from there into uncontrollable laughter. All I could make out was "Amy" and "Weight Watchers." 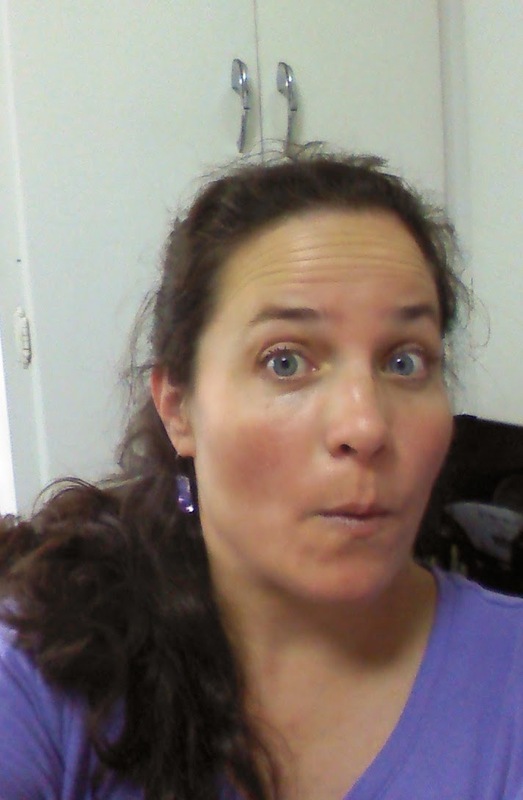 Once she regained her composure, she said she found this old email from her friend Amy about some old WW recipe cards from the 70's that had been found and posted on this website. Mother of all that's holy! We read through these over the phone and I can honestly say I laughed, I cried, I got choked up, had a coughing fit, gagged a little. I guess the 1974 strategy was to make people make and attempt to eat this stuff, which of course they couldn't finish and viola! the weight just fell off. Melt away the pounds by combining fish and bouillon and jello and tomatoes and old socks and stuff. Give yourself a hysterical good laugh. And I'd recommend bookmarking this post so on one of those days when you're on the verge of killing a co-worker, going to jail for road rage or thinking of setting something on fire, you can simply peruse these vintage (dare I say classic?) recipes. As Marcy would say, "disfrutar de la cantidad de cosas enchilada Apuesto." I've often found myself most satisfied and fulfilled when I make something that is so simple yet so sensational. It's almost poetic when fresh, basic ingredients combine and create a remarkable result. Today I refer to chimichurri. Chimichurri is most often characterized as an Argentine condiment. 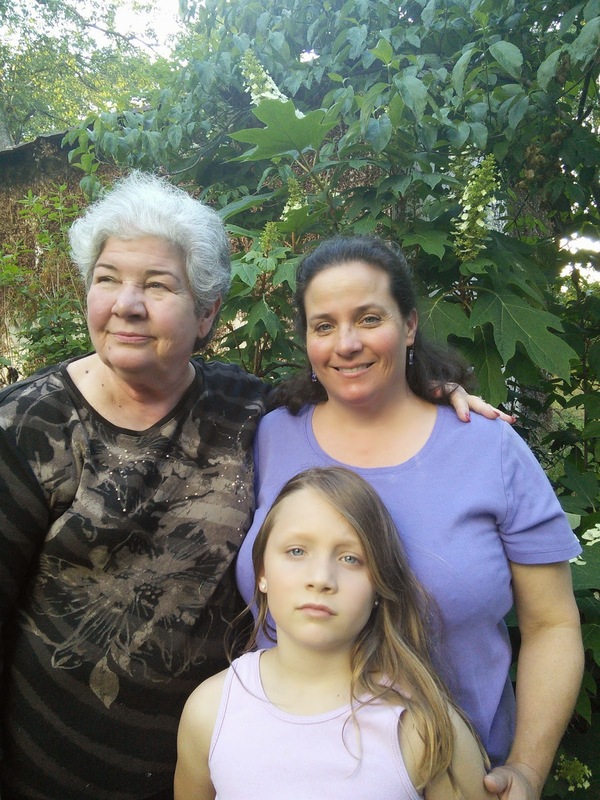 Argentinians love asado, or barbeque. Grilled steak is quite common, cut into long strips and cooked on the asado. And what do Argentinian steakhouses serve instead of Worchestershire, A1 or Heinz 57? Something much more interesting, quite frankly. Chimichurri. Use the back of a spoon to mash up the salt & garlic to make a paste. Then mix all ingredients together. That's it. You can use immediately or cover and refrigerate for later. Our dinner tonight was warm, leftover thin sliced beef tenderloin, roasted potatoes and the Mullaney Salad. As we sat down at the table, the Wunderkind looked at the sauce, stirred it with the spoon and said "Oooh, this is what I was smelling earlier!" Without a moment of hesitation, she spooned some on her plate to try on the side (at my suggestion). Turns out she loved it and proceeded to ladle more over her steak. All you moms who cook for kids will surely recognize this as WINNING. And, come to find out, chimichurri is also really tasty on roasted potatoes! 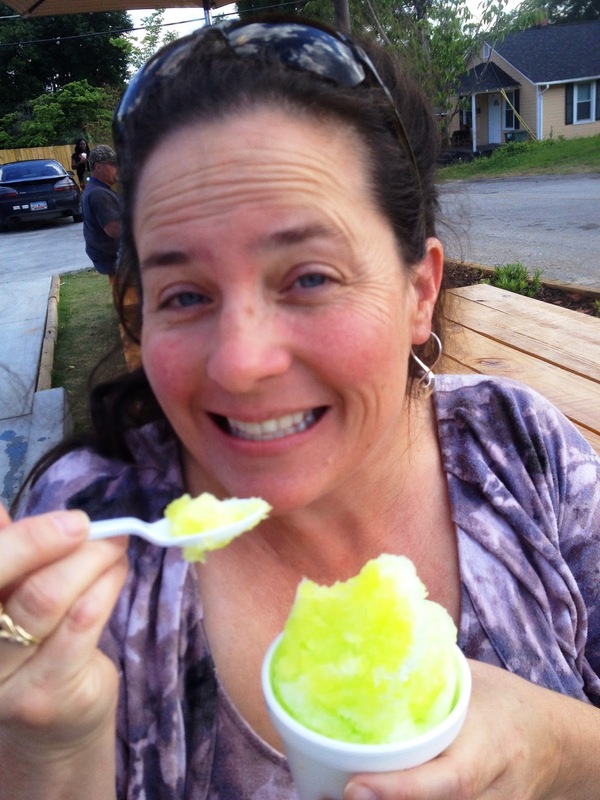 As soon as the long-awaited Pelican's SnoBalls opened on Rosewood Drive, my daughter made me turn the car around to give it a try. On our first visit, she selected a combo of raspberry and cherry. As you can imagine, she was quite pleased, being the little sweet freak that she is. 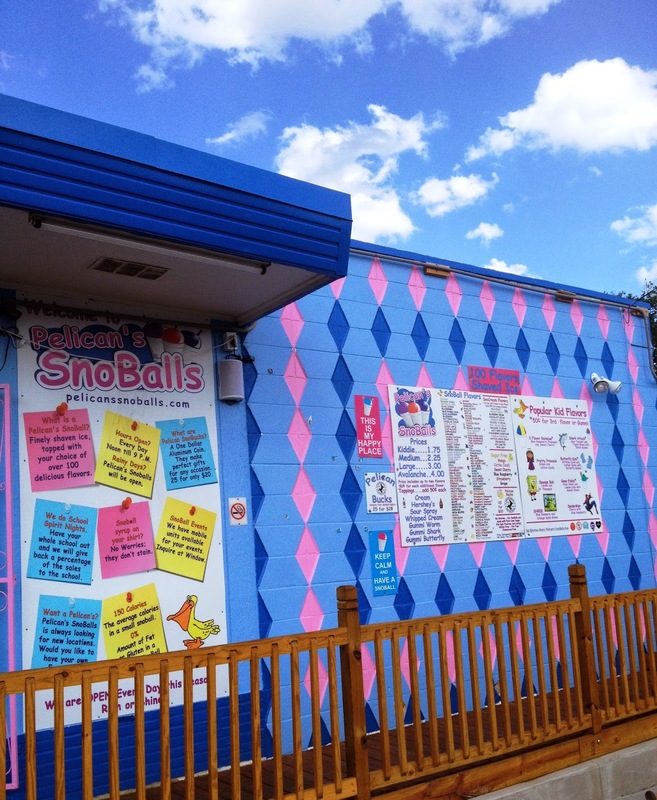 While we stood in line, I perused the extensive sno-ball menu. I was amazed at all the flavors (100 to be exact.) Crazy flavors like wedding cake, tiger blood (?) and toothpaste. But one flavor really stood out. I mean really. Ever since that day, I can't quit thinking about it. I've tried to imagine what in the world it would be like. I pondered and contemplated. After all, I am a huge fan and connoisseur of the real thing. I just couldn't get it out of my mind. It was quite clear...I had to try it. There was no way around it. The flavor? DILL PICKLE. I picked up the Wunderkind from school and headed straight for Pelican's. Today was the day. I told the guy at the window how I've been obsessing about this flavor and he even gave me this look as to say "Seriously lady? Are you sure?" He handed it over and eagerly awaited my first taste. As soon as it hit my tongue, I could definitely taste the dill pickle flavor. But quickly I noticed that after a few bites, it begins to get sweeter, almost limey. I learned that if you take a break and then have another bite, you'll pick up that dill flavor again. It was actually quite good. Although I must say, I was really hoping it would be more sour, like a real pickle. You would think that kids would hate it, but Viv liked it. She chose the "gone fishin'" which is a combo of polar punch, lemon-lime and is studded with gummy worms. As we got in the car to head home, she asked if we could trade. So, I ate hers on the way home but once we pulled into the neighborhood, she decided it was time to trade back. 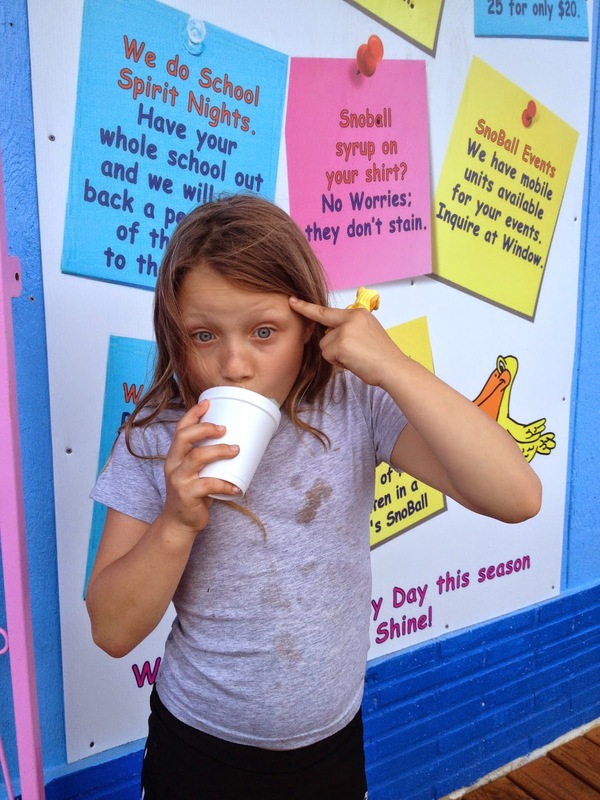 This is appropriately captioned "the brain freeze"
If you're unfamiliar, the SnoBall is, apparently, a native of Louisiana. 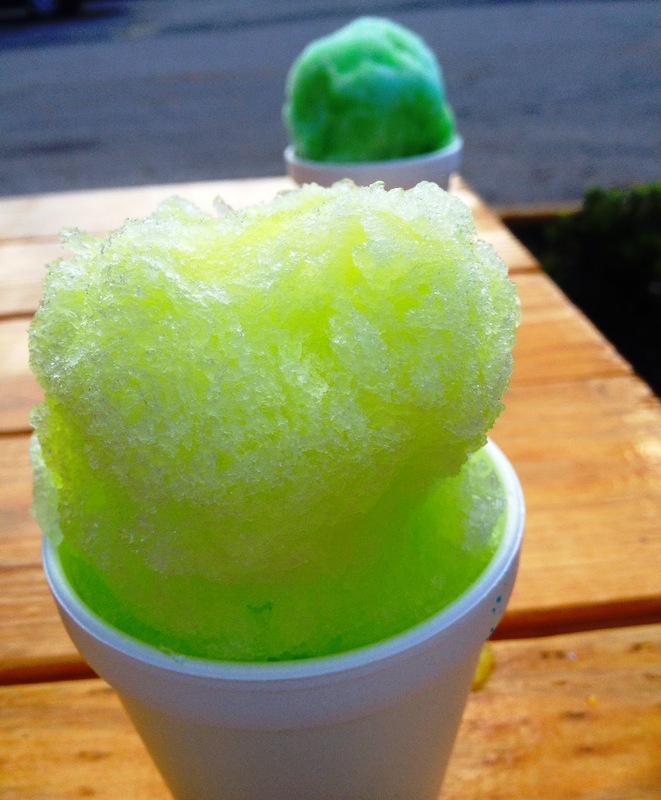 The Pelican's SnoBalls is located on the corner of Rosewood and S. Gregg. They have a parking lot behind it which is about the size of a postage stamp. But don't worry, you can find a park around the place if the lot is full. They have 3 picnic tables and umbrella's set up along S. Gregg. And, if you try all 100 flavors in one "season" you win a T-shirt and bragging rights. 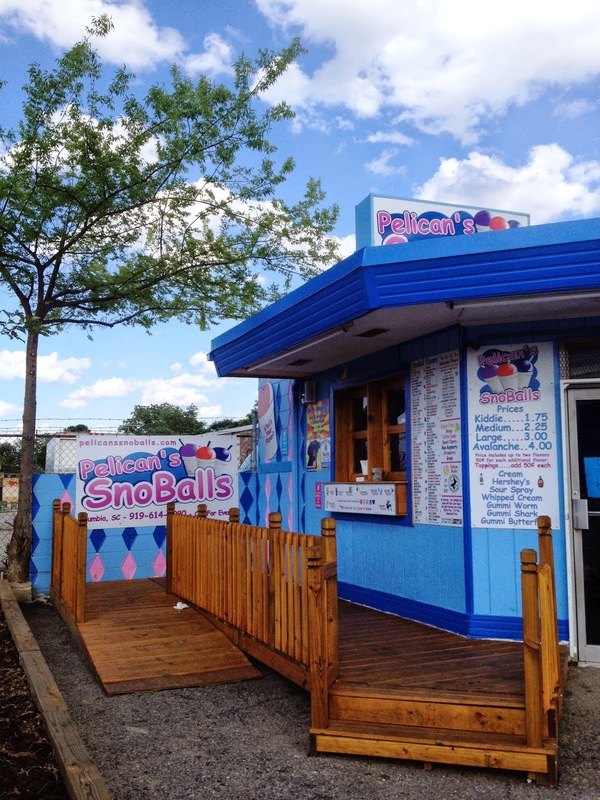 I might be able to do it, but the toothpaste SnoBall could be what stands in my way. It's been several years that my parents have been telling us not to buy them presents. Birthdays, Christmas, Mother and Father's Day. Their logic is they have everything they want & need and if they don't have it, they go and get it. Makes sense, but of course, my sister and Neil and I don't feel completely right about it. So, we try to figure out either a gift of something they haven't gotten for themselves (like the Keurig we surprised Dad with at Christmas) or we find something creative we can do. This year, as I was contemplating Mother's Day, my mom offered up something that she'd like as a gift. JACKPOT! Not just a hint or a suggestion, but a direct request! This is what she said: "I want you to cook Lobster Thermidor for me." Did you hear that? That thing that sounded like a loud Hosanna? This was perfect. She wants me to cook for her, which I love to do. She wants lobster, which, well hey...if you know me, you know that this is my nectar of the gods. Everybody wins! 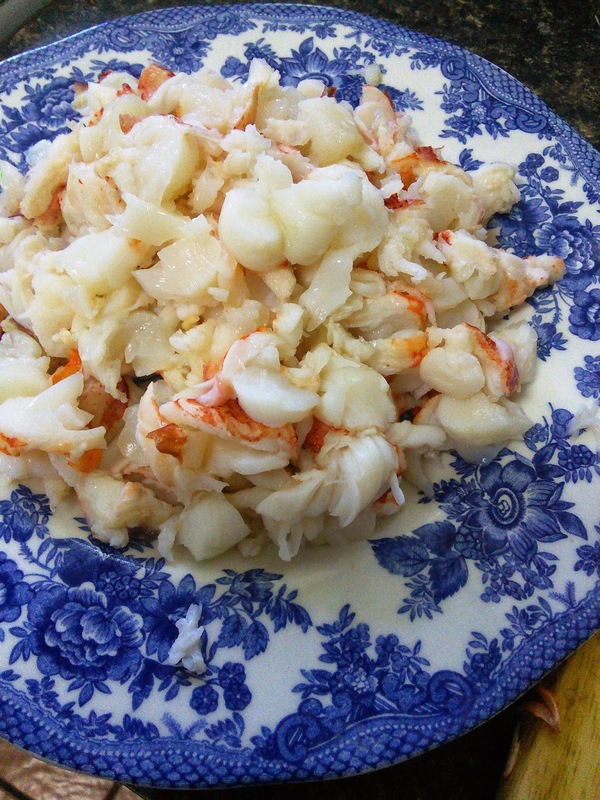 I pulled out my trusty Lobster at Home by Jasper White and studied up on the recipe. Just reading it makes me hungry for this decadence on a plate. Seriously, if anyone tries to tell me that chunks of lobster, a wine/shallot reduction, and a rich Mornay sauce doesn't sound good, I have no choice but to declare them mentally incompetent. We had lobster tails available rather than the whole lobsters. I briefly submerged them in boiling water to "parboil" them. Look at these beautiful little monsters! After they cooled a bit, I cut them into 1" chunks and refrigerated while I worked on the rest. Next, I started the Bercy reduction. This consists of white wine, lobster broth (which I had in my freezer from my last lobster binge), chopped shallots and fresh ground pepper. 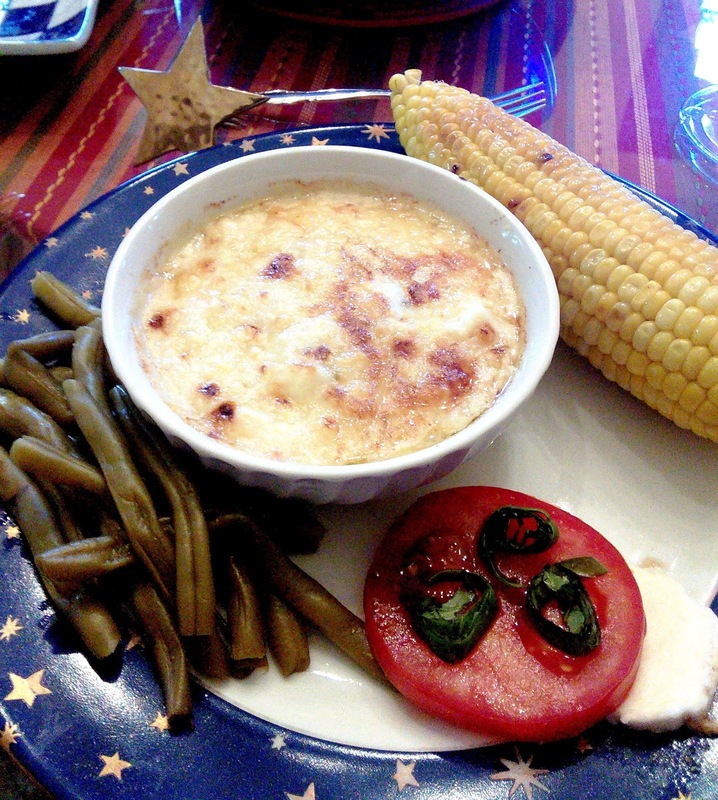 Next, I moved on to the Mornay. You start by making a blonde roux, add milk and simmer. Once it begins to thicken up, you add gruyere and parmesan. Meanwhile whisk together some cream and an egg yolk. Temper it with some of the cheese sauce, then add it in to the rest of the sauce. Complete it with the Bercy reduction, some Dijon, lemon juice, salt & pepper. 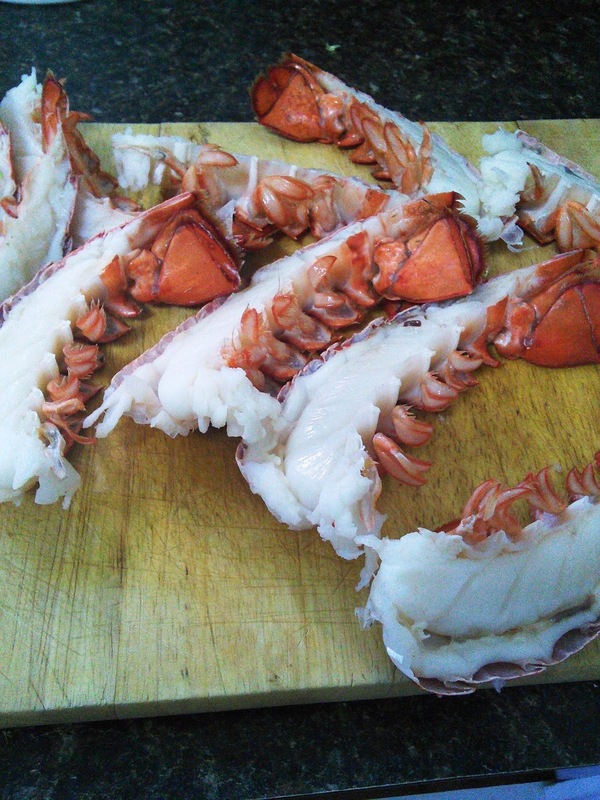 Now, in the classic preparation, you'd spoon all this sinful deliciousness back into the lobster shells. However, since I only had the tails, it was evident that I had way more Thermidor than I had shells. So, I opted for ramekins. Topped off with more of the cheese mixture and popped them in the oven. As you've surely gathered by now, we all gained 10 pounds at the dinner table but it was so worth it. So rich, so luscious, so over-the-top. My mom was thanking me for cooking it and I was thanking her for wanting it to be cooked! It's been years since I've eaten this dish and certainly the first time I've made it myself. 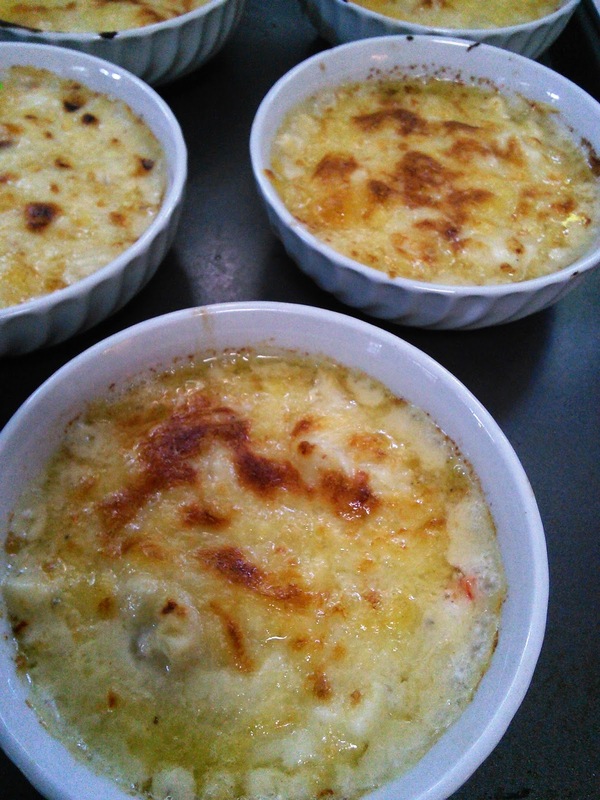 I already have ideas of how I might change it just a tad and to use the Mornay as a base for my own version of a luxurious lobster mac-n-cheese. The recipe is easy to prepare, but long to write. If you're interested in getting it, just write a comment below and I'll get it to you. 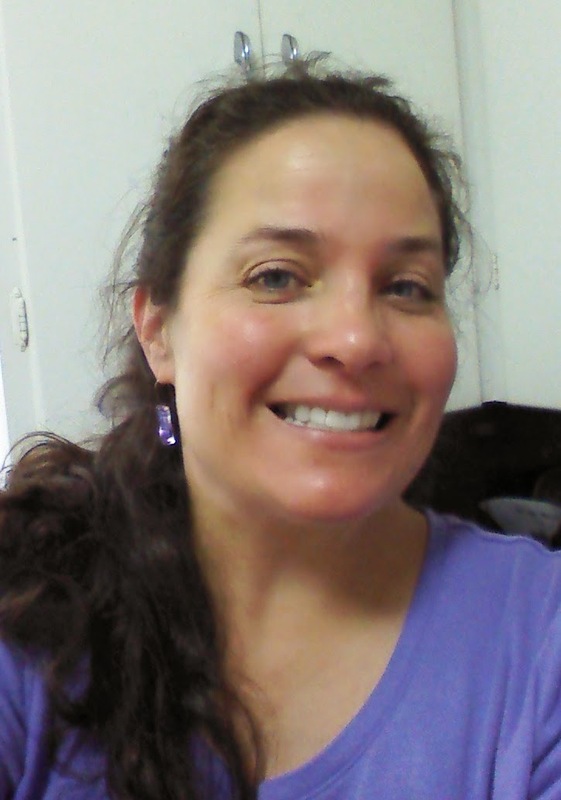 Don't you love it when you're just having a regular ol' day and then an invitation comes to you and makes you think, "Wow, I'm one lucky lady"? This happened to me a few days ago. Some of my fellow food blogger friends and I were invited to The Oak Table to taste their new Spring menu. I haven't made it to The Oak Table yet, so I was delighted to accept the invitation. And it's true...I was lucky indeed. The Oak Table changes its menu seasonally. They have made a commitment to featuring as many local ingredients as possible in their offerings. The result is an exciting, refreshing and interesting menu for the season. We were hosted by the lovely Vanessa Driscoll, owner of the Farm to Table Event Company and the General Manager of The Oak Table, Nathan Moody. What I thought would be a couple hours turned into four hours of delicious sampling and fun with friends who love food as much as I do, on a perfect evening (we were on the patio). So, let's just break right into it, shall we? First, we were served one of the new cocktails called the "spring thyme." This is a remarkably refreshing concoction of cucumber vodka, thyme, mint, ginger vodka and Cannonborough honey basil soda on top. It conjured up a fond memory of Hendrick's gin, which I kind of forgot about, but was even more "herby" and crisp. Next, we were brought two salads: the "spring carrot salad", which featured artisan carrots and the "cured local fish salad". I know that sounds kind of funny, but it's no laughing matter. This was a mix of frisee and arugula with thin sliced cured salmon draped over and studded with shaved fennel and almonds, all dressed with a lemongrass vinaigrette. I loved this one! The carrot salad featured artisan carrots, like I mentioned, sugar snap peas, shaved Pecorino, pistachios and was dressed with a sweet pea vinaigrette. 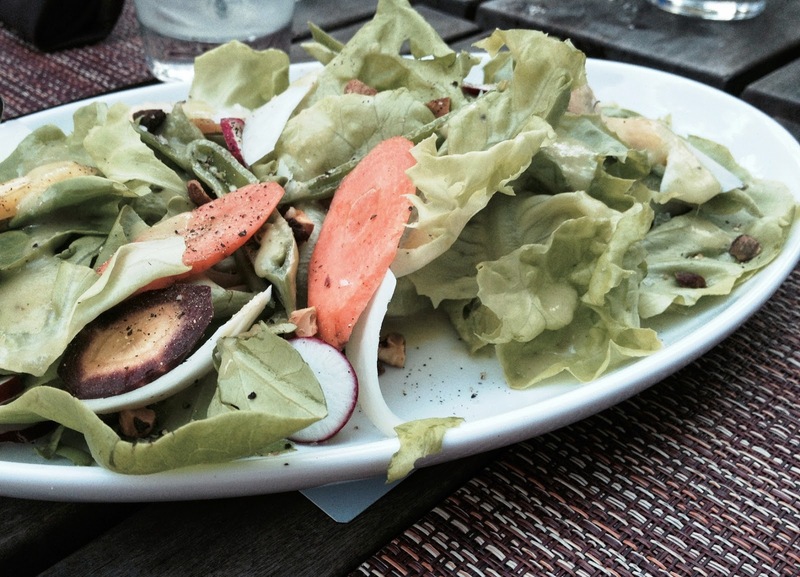 This was a very light salad which is perfect for spring. 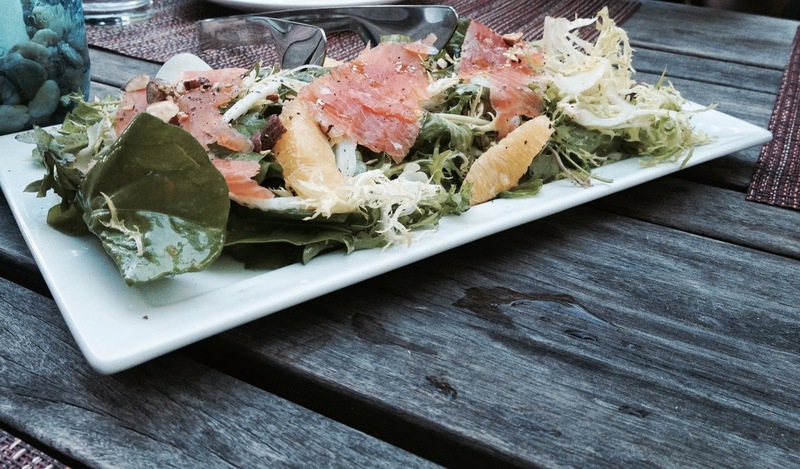 Out of the two, the salad with salmon was my favorite. About the time we were finishing up with these lovely salads, the "strawberry harvest" arrived. I must admit that I'm not much of a strawberry fan except this time of year when they are in season. 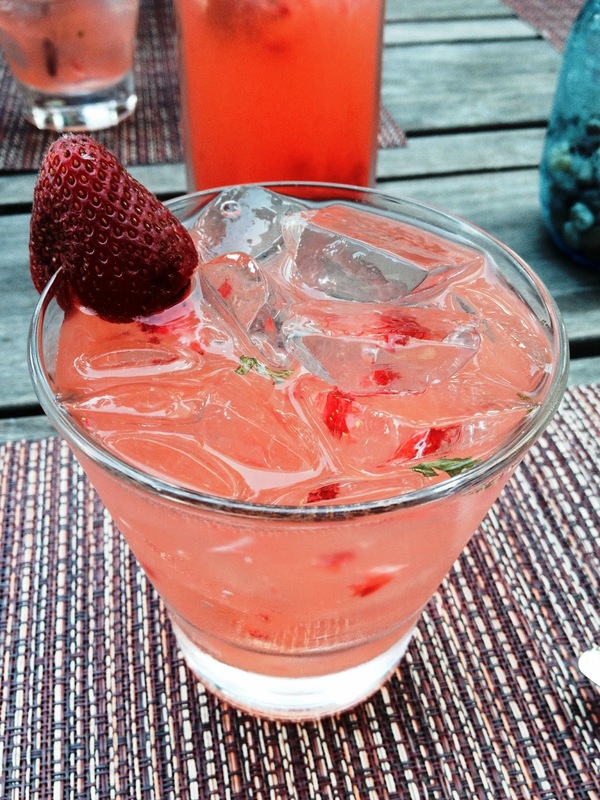 This cocktail consists of local Cottle Farms berries, Bee Trail Farms honey, mint, vodka and the Cannonborough honey basil soda. It was simply delicious! I could sip on these all afternoon. 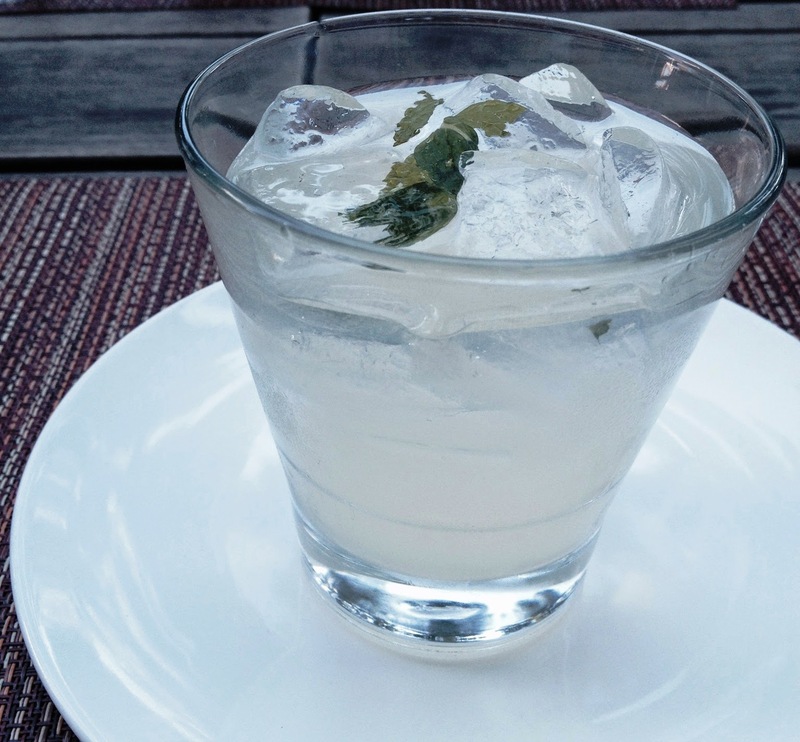 The combination of ingredients is perfect and the flavor is exactly what you look for in a refreshing spring-time drink. Bravo on this one, for sure! Strawberry Harvest. As beautiful as it tastes. You're feeling really jealous about now, aren't you? Next, we were treated to a couple of the appetizers. 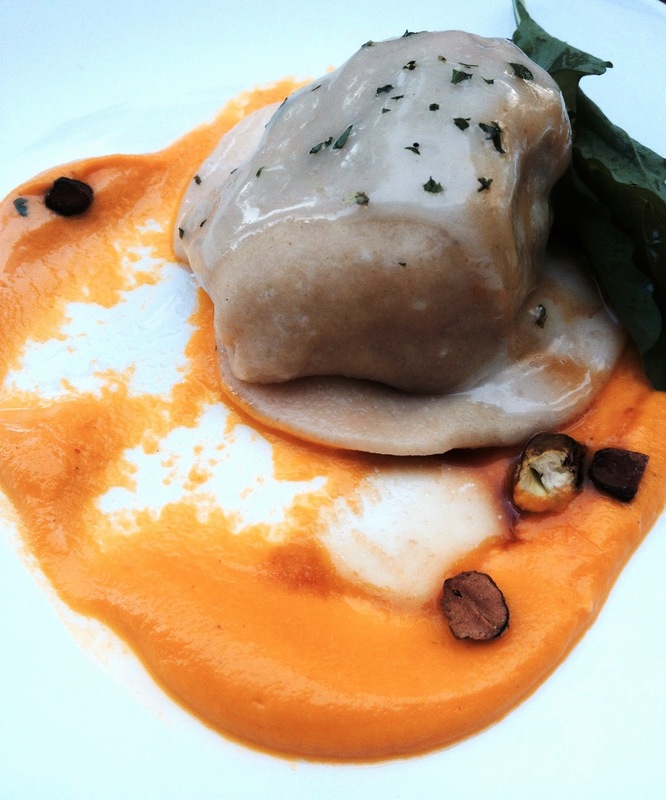 First was the "braised rabbit ravioli", which my buddy April aptly renamed "rabbioli." It is a large, pasta pillow amply stuffed with shredded rabbit (imagine how pot roast shreds) placed atop a yummy carrot-ginger puree and finished off with some arugula and pistachios. This was a big hit with everyone at the table. Then came one of my favorites of the evening: the "black pepper ricotta gnudi". 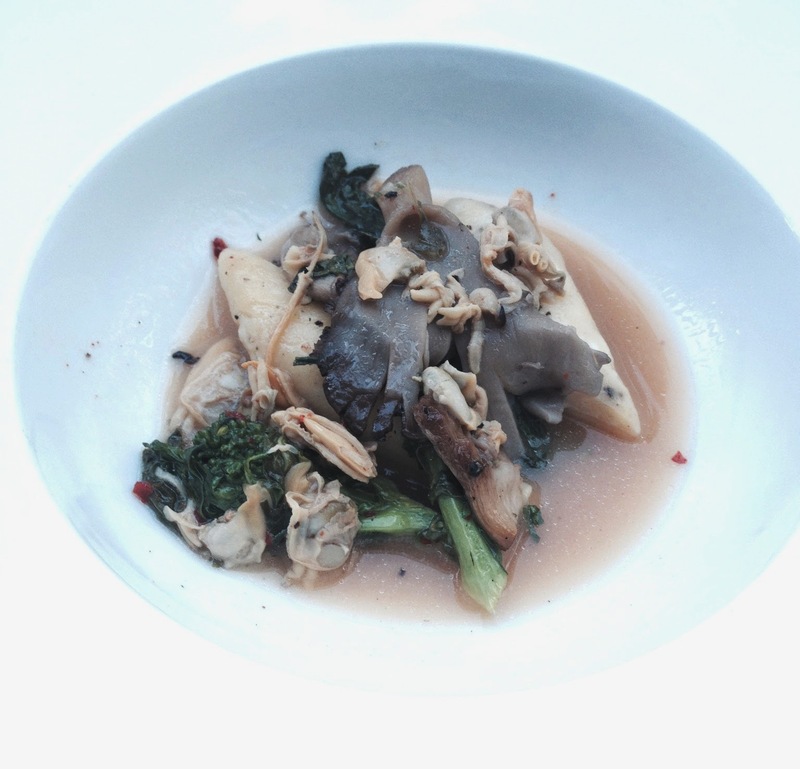 It was served in an amazingly delicious broth with littleneck clams, broccoli rabe, oyster mushrooms and aleppo pepper. The gnudi was full of fresh pepper flavor but that broth, OMG. At April's suggestion, we all picked up our bowls and drank the rest. Sorry Oak Table, we just couldn't resist. Had we been in the dining room I'm sure this would have been frowned upon! Luckily, we had the patio to ourselves. I mean, look at it. It just looks like a dream! At this point, my head was spinning from all the fantastic food, so I may mix up the order of the next dishes we tasted. But I'm sure it's all the same to you. Out came the "Niman Ranch pork chop". This was definitely one of my favorites of the night. The pork was perfectly cooked. P.e.r.f.e.c.t.l.y. Juicy and tender and then accompanied by the most wonderfully crispy sweet potatoes and spicy mustard greens. Frankly, just the fact that one of our restaurants is using mustard greens makes me happy. Of all the greens, mustard is probably the least famous. But they shouldn't be. Between samples, I was reading the menu and asked Jonathan (he writes and photographs for Free Times) what in the world is "wreckfish." He knew. So, he enlightened me and said it's one of his favorites fishes. Well, lo and behold, our next course was the "pan-seared wreckfish". Jonathan knew what he was talking about. This is a meaty fish like grouper. 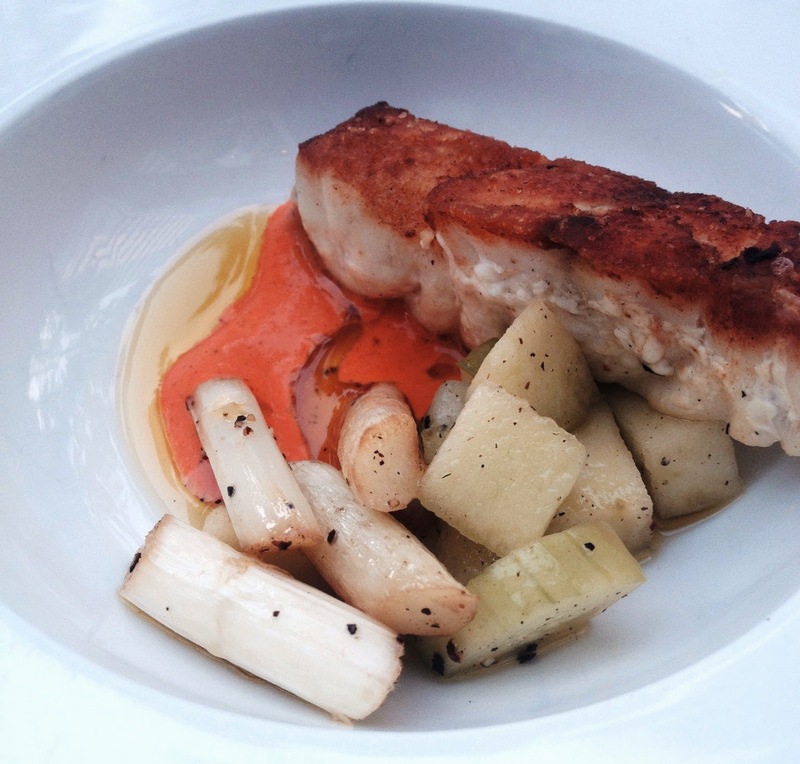 It was served with a green gazpacho, white asparagus and romesco. I have a new favorite fish it would seem. You are probably getting full just reading and seeing these pix, right? 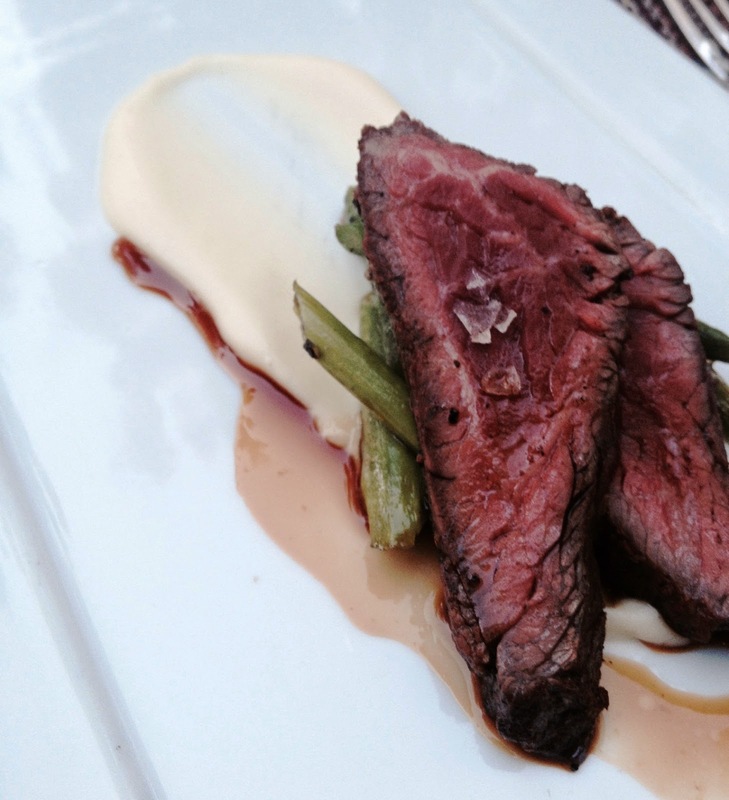 So how about getting your head around some "grilled Angus hanger steak"? Once again, this is served with a cool assortment of veggies: asparagus, shiitakes, grilled spring onion. You'll notice a smear on the plate. This was pureed Japanese sweet potato. I've never encountered this vegetable before. It was very faintly sweet and silky smooth. All of this was accompanied by Bordelaise sauce. 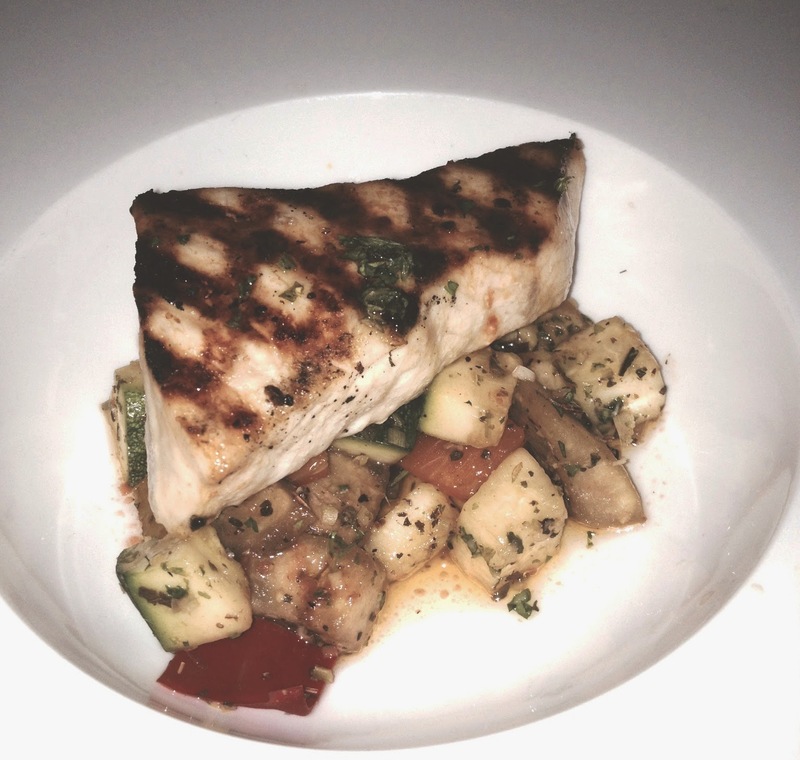 And just when we thought surely dessert was coming, we were surprised by a serving of "grilled local swordfish"! The fish was nicely grilled and served with a "rustic" ratatouille and tomato oil. I'm not sure what makes it rustic, but I do know that as a HATER of classic French ratatouille, I can say this is different and much, much better. So, somewhere in the midst of all this heavenly food, another signature cocktail arrived. This one is called the "Legend of the Fall". 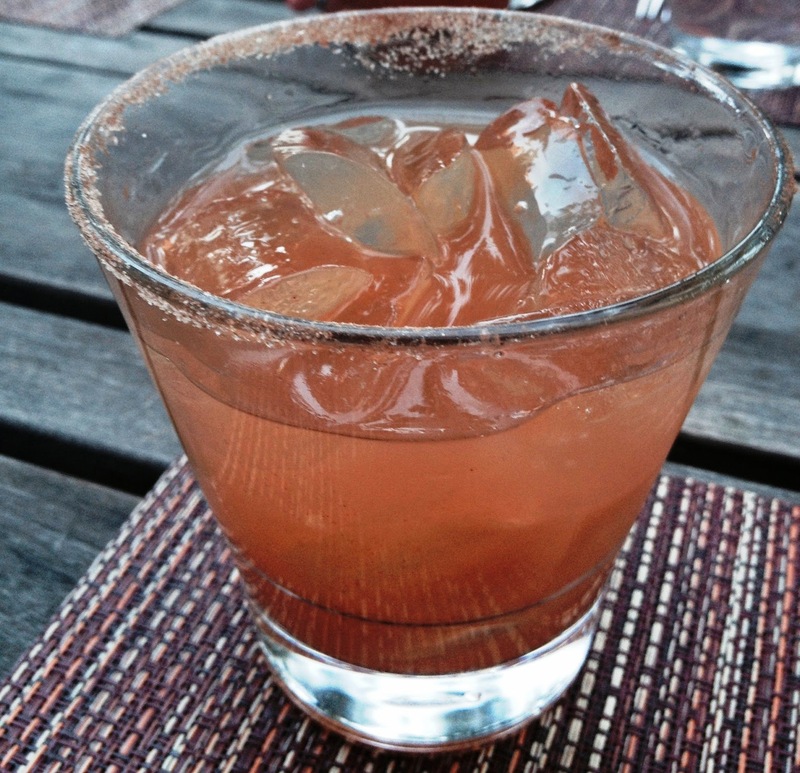 It's composed of Jack Daniels Tennessee honey, cinnamon apple cider, lemon juice, walnut liqueur and comes with a smoked cinnamon sugar rim. To me, this was like apple pie in a glass. Very tasty, but since I'm not a huge sweet freak, I couldn't drink more than one of these. After dinner, we all discussed & gave our critique and the consensus was that this is delicious but would probably be a more popular choice in the fall. Legend of the Fall. Neither Brad Pitt nor Anthony Hopkins showed up. As we all wondered how much weight we'd just put on, dessert arrived. We were served two: Blini with strawberries and pineapple carrot cake. The cake was by far my favorite. 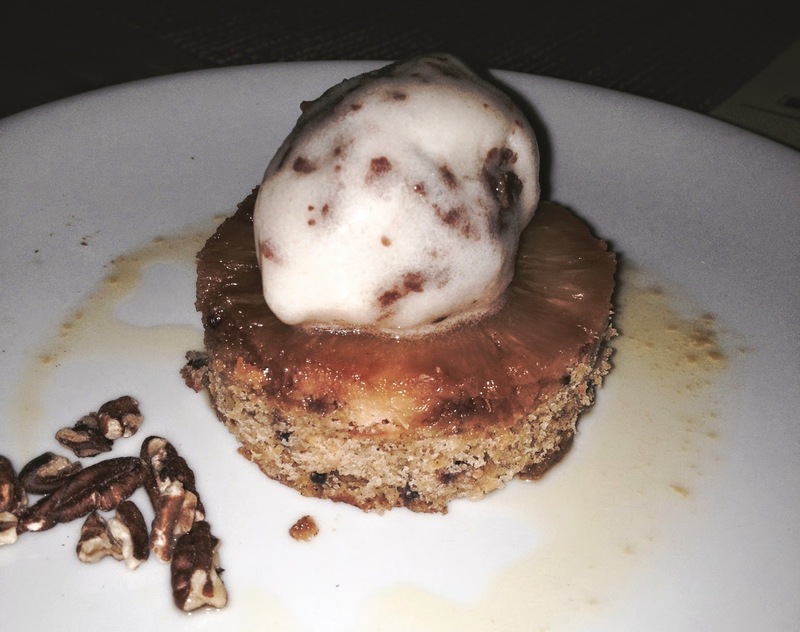 It was a small cake topped with a slice of grilled pineapple. That was then topped with a small scoop of banana ice cream. A "streusel" of nuts and chocolate were sprinkled over the top. Again, not being a big sweet eater, I usually don't order dessert. I'd order this again and again. 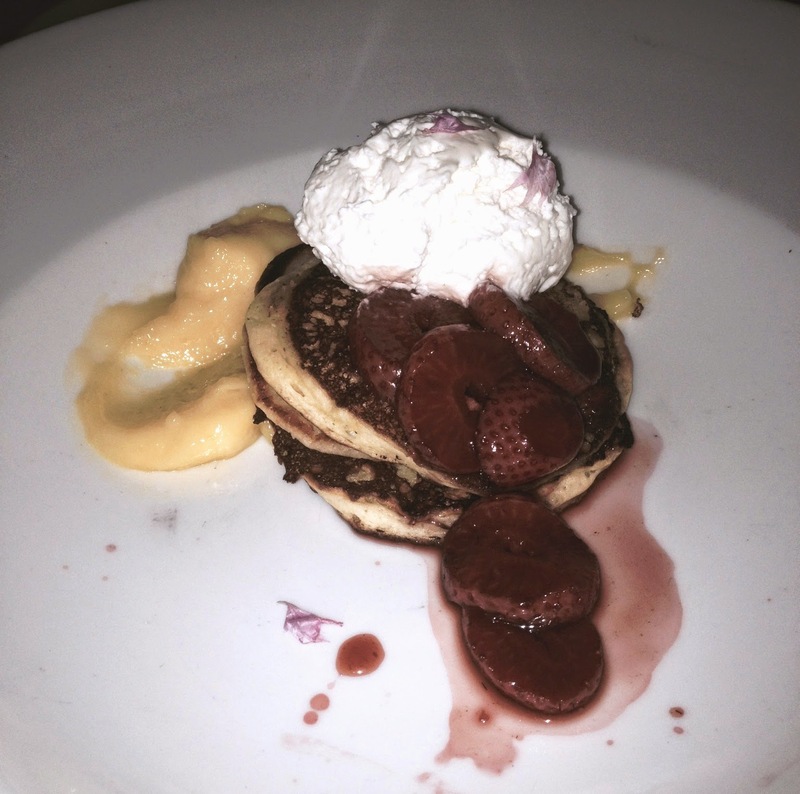 The blini with strawberries was quite interesting, but alas, not a hit with me. It was served with lemon curd, which was very good, some mildly sweet whipped cream and strawberries. However, the strawberries had been smoked. This is certainly a new one for me. I never would have ever thought to smoke a strawberry. I now know that I don't care for smoked strawberries. But, there were some at the table who enjoyed it, so it's not a fail. Just wasn't my cup of tea. This is the only negative I have about the entire evening. 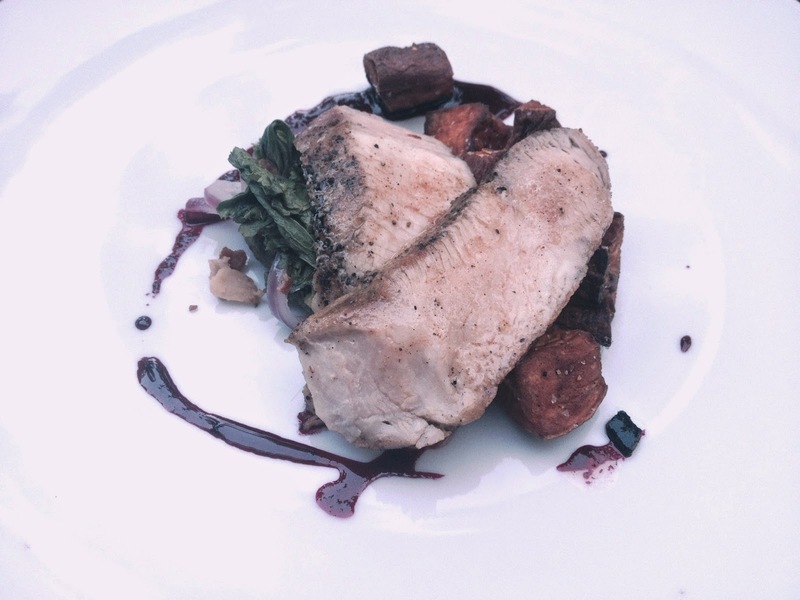 The Oak Table's current menu is exciting and different and is packed to the gills with local foods. The local food scene in Columbia has grown by leaps and bounds and it's so encouraging to see so much of it showing up on our menus. I can't thank Vanessa, Nathan and Chef Howard enough for inviting me (us) to come sample all this delicious fare. It was a very pleasant evening filled with flavorful treats with other food lovers. And as you can probably guess, we all burned up our batteries taking pictures of our food. Yep, we're those people you see in restaurants pointing our iPhones at our plates. Yep, that's us.